Maria, our BLG reader brought us a very funny story this week. When we spied a cat on the back cover, the shouting started, “It’s Chester!” “No, Splat!” Obviously we have a thing for quirky cat characters. 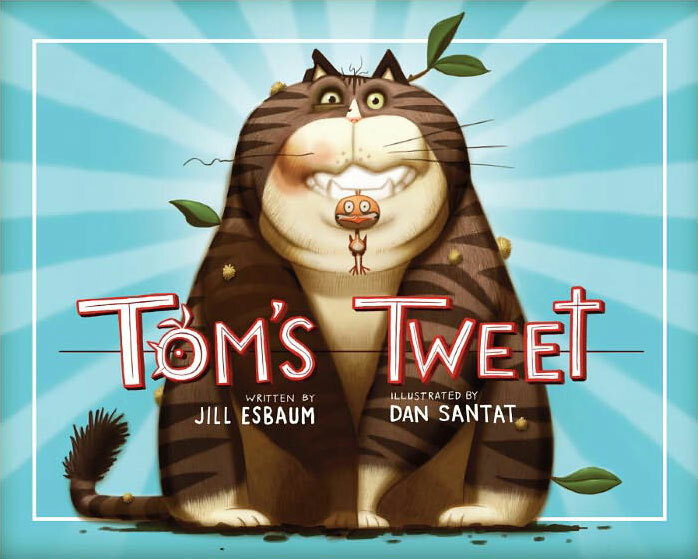 And with Tom’s Tweet, written by Jill Esbaum and illustrated by Dan Santat, we have a new feline to add to our list of endearing, funny cats! What’s a poor cat to do when a potential treat turns out to be a shivering tweet? He can’t in good conscious eat a little thing that is just “feather and bone” even if it is a bird and he is a cat . . . And how exactly did Tom end up with a tweet between his lips on route to return it to its nest while being pecked at by an angry Mama Bird? Could this cat have a soft spot for the little Tweet? It seems so. And it makes for quite a hilarious story. One of my students kept whispering to me as Maria read, “It will be about kindness.” “It’s going to be about kindness.” “Really, just wait, this will be a kindness book!” We have been reading many picture books on this theme and he saw through Tom the Cat’s bravado early on in the story. This cat was a goner for the little Tweet. There is even snuggling! 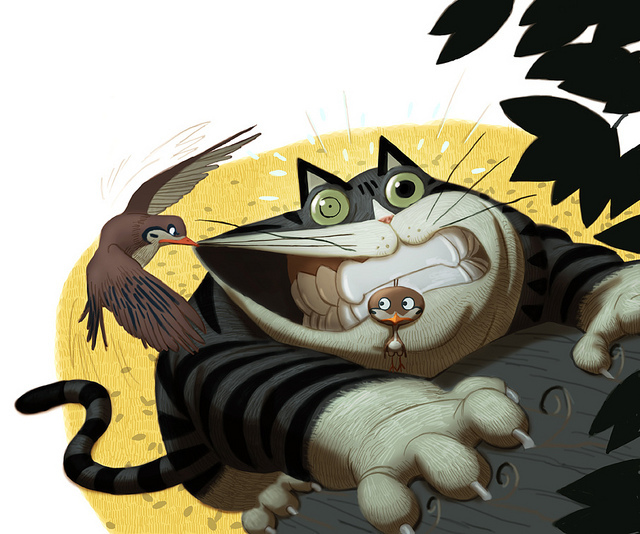 Even though Tom insists he is “not that kind of cat.” In the end, even Mama Tweet realizes Tom’s true nature and emplys him to do some “tweety -sitting.” Dan Santat’s illustrations are superbly animated and our read aloud was full of giggles and smiles. A wonderful book for happy sharing! Truman: I really like the illustrations and the part where Tom gets pecked! Funny! Isa: I liked the part when Tom was dreaming about the birds. He couldn’t help it. That was so funny. Khai: It was funny when Tom had to babysit the tweets! This entry was posted in BLG Reads this week and tagged BLG Reads, Dan Santat, favourite illustrators, fiction, friendship, great read alouds, Jill Esbaum, picture books by carriegelson. Bookmark the permalink.